Two days back, we were talking about work conditions in corporate offices and he challenged the elitist mentality that private companies project; the red tape culture that is in no way different from government offices. He was unable to eat the tasteless mash that is doled out day-in and day-out in their office canteen and despite complaints the system is unchanged. Just to avoid further confusion he has religiously paid up his canteen fees lest the higher authorities raise a hue and cry over why this 'saab' has all the problem when the others are satisfied! That's how it is everywhere I guess. The degrees vary. (2017), an earnest masterpiece chronicling a teenager's hopes, struggles and determination. In one of the scenes Dr Praveen Kumar, the secretary of the State Social Welfare Residential Educational Institutions Society visits the school where Poorna is a student for a check.He is a simple man with no airs and amiably expresses his wish to eat lunch with the students. The principal is skeptical but he is in no position to prevent the secretary. When the food is served the principal wriggles out saying he is on a fast. One morsel is enough for Kumar to know the true picture. He looks at the students around who are silently eating whatever has been served, pauses to clear his mouth and gives a cold stare to the principal. The message is quite clear. What makes them serve this unpalatable trash to these poor students? Just because they are poor they are being treated with utter disdain. And this, despite the funds distributed regularly to the organisation. Yet again, through this brilliant scene, we get a glimpse of the corruption rampant in our country. It has permeated to every level possible. The film is a cinematic documentation of Poorna Malavath's success story. Evocatively rendered by Aditi Inamdar, Poorna is the youngest teenager to summit Mt Everest in May, 2014. But this is not a film on mountaineering. The story actually delves into the background of Poorna and what propels her to follow her dreams. Born to farm labourers in Pakala, Nizamabad district in the Telengana state of India, girls like Poorna are not motivated to succeed. Abject penury and hardships cripple their very existence. They are married off early and so, education, career, all these words are never introduced or encouraged in their vocabulary. Amidst this sordid surrounding are two girls who see no harm in hoping for the stars. Poorna and her cousin, Priya, while returning from school everyday sit on a tree branch and talk about their aspirations. Priya is vocal about what she wants to be when she grows up and Poorna is fascinated by her sister's tales. But a cruel blow shatters Priya's dreams when she is forcefully married off. She instigates her sister to run away and join the school run by the State Social Welfare Residential Society where students get to eat good food, replete with eggs, pulses and vegetables. Poorna's father relents and sends his daughter there for a short while. Priya passes away during childbirth leaving Poorna shattered, disillusioned and in a state of shock. During this difficult phase, Kumar's kindness and motivation helps her tide over her apprehensions. Watch this film to see how Poorna never throws in the towel despite the obstacles and the hardships. She triumphs and keeps the flame in her heart alive. 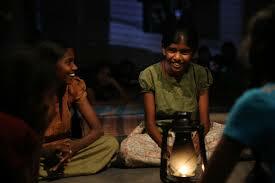 The film is a restrained but sharp commentary on the life and times of poor girls in the villages of our country. In this rough weather when you see an honest official bringing forth a change, he needs to be supported and applauded. Bose's direction is absolutely splendid. He peppers the films with some unforgettable scenes. destination. In the penultimate scene where Poorna, suffering from a serious bout of hypothermia, is about to give up from reaching the pinnacle, her mind is filled with the vision of Priya egging her on. That scene brought tears to my eyes. When Priya dies, the last word she takes is Poorna and we know that she wants to tell her sister that the world did not give me a chance. But you don't give up. As the fire rises up from Priya's pyre, Poorna's shocked face tells of the devastation she suffers in her mind. Her dearest friend and confidante is no more. She sees no reason to carry on. 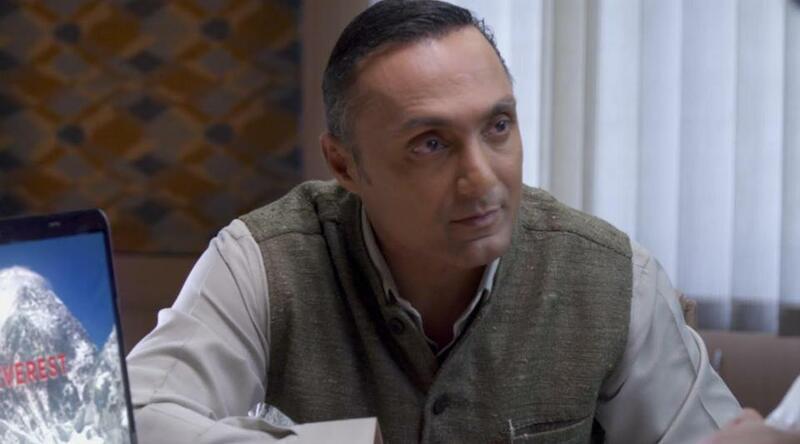 The film has no known actors except Rahul Bose (and Dhritiman Chatterjee in a bitsy role). That turns out to be its trump card. Bose plays Dr Praveen Kumar, the man behind Poorna's success. He infuses his character with a sharp sensitivity. He is soft-spoken yet determined and will not take nonsense from anyone. In the scene where the food officials barge into his room, he simply cuts them out ordering their suspension. That's a whiplash. There is another effective scene. When Kumar visits the school where Poorna studies, he walks up to the assembly area to jot down a couple of motivational quotes on the notice board. In the absence of any leaders to follow or any light to look up to, maybe these lines will pique the interest of these poor children. But I feel the best scenes of Bose are with Poorna. There are times when Poorna is wary of what lies ahead of her in her journey to the top, Kumar does not force his opinion on her. He lets her follow her heart. But when she comes back to him reassured and driven, there is no stopping him from showing her the way forward. 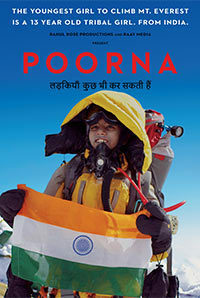 Towards the end, when Poorna is about to summit, Kumar is shown waiting in his office for a phone call from the base camp. Tension is seeping out of his pore. He has put a lot at stake, his belief, Poorna's life and the aspirations of all those who never thought of coming this far ever. When he receives the call, he doesn't jump or scream. He just smiles and his eyes turn watery. This is only the beginning of Poorna's beautiful journey, he knows it and believes it with all his might.